Margaret Thatcher's policies as prime minister changed many aspects of British life, and were collectively called Thatcherism. But what does the term mean? A handful of political leaders are influential enough to have an ism after their name. But no political philosophy has shaped a nation in quite the same way as Thatcherism. 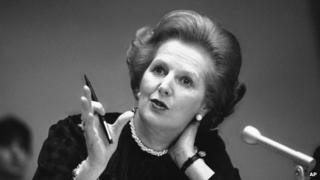 At its most crude, Thatcherism represents a belief in free markets and a small state. Rather than planning and regulating business and people's lives, government's job is to get out of the way. It should be restricted to the bare essentials: defence of the realm and the currency. Everything else should be left to individuals, to exercise their own choices and take responsibility for their own lives. This was a revolutionary, even dangerous, notion to most postwar politicians. Central planning of industry and society had helped win the war. The only way to "win the peace", it was believed by the leaders of both the Labour and Conservative parties, was to plan and control industry, vast swathes of which were owned by the state. Margaret Thatcher was not alone in rejecting state ownership of businesses and socialist central planning. Like other right-wingers of her generation, she had been influenced by The Road to Serfdom, by Austrian economist Friedrich Hayek, which warned of "the danger of tyranny that inevitably results from government control of economic decision-making through central planning". But Hayek's brand of free-market economics was deeply out of favour in the 1950s and 1960s. It was only when the country had been crippled by industrial strife and decline that it began to look like a credible alternative. Thatcher belonged to a Conservative Party faction, headed by Keith Joseph, who were followers of Hayek's Austrian school of economics and were also heavily influenced by the theories of American economist Milton Friedman. Had Joseph become Conservative leader instead of Thatcher. which seemed the more likely outcome at the time, then something resembling Thatcherism might have emerged as the prevailing economic philosophy of the age. But it would not have been the same. It took Thatcher's own background and personality, her belief in traditional family values and strong defence, her suspicion of an overmighty Europe and instinctive affinity with the US, to give shape and meaning to what we now know as Thatcherism. Taking her cue from Friedman, she advocated monetarism, controlling the money supply with high interest rates, to tame inflation without resorting to union-negotiated pay policies. Her battle against inflation led to mass unemployment, but despite that she managed to win a second general election. Low taxation was a key area where Thatcherism was applied. Under the previous Labour government, there had been high levels of income tax for high-earners, but Thatcher progressively cut income tax - the basic rate of tax fell to 25%, while the higher rate was slashed from 83% to 40%. There was a shift away from direct taxation to indirect, for example by increasing VAT from 8% to 15%. Thatcherism also focused on rolling back the frontiers of the state. To that end, Thatcher introduced privatisation of state-owned industries, including British Telecom, British Gas, British Airways and electricity companies, putting them back into private hands. Such a retreat of the public sector from large areas of the industrial landscape would have seemed unthinkable a few years before, but were pushed through. Since Thatcher's day, such privatisation has gone further, says Thatcher expert Professor Richard Toye, of the University of Exeter, citing the privatisation of British Rail under her successor John Major. There was also a huge sale to tenants of council housing. The government also abandoned its commitment to full employment, stating this was the responsibility of employers and employees. Thatcherism is also associated with the Iron Lady's own personal style, says Prof Toye. "She saw herself as a conviction politician. She prided herself on her - what she would call - steadfastness, and what others would call her inflexibility." She inherited a party that contained supporters of her predecessor Ted Heath, labelled by her as "wets", who opposed her monetarist policies and cuts to public spending. In the early stages she had to continue to include them in the cabinet, says Prof Toye, but then gradually she rid herself of them. "It was not clear in 1975 what a Thatcher government would mean for Britain. And it was clear when she came to power that she couldn't move too far too fast. That was reflected by her moving with caution and carefully at first in her first term." Although Thatcherism was based on the austere-sounding philosophy of monetarism, Thatcher wanted to put a human face on it, so she talked about running the country's finances like a thrifty housewife. She also made much of her personal story. "It was a fundamental part of her image - emphasising the value of hard work, her background as a grocer's daughter," says Prof Toye. She contrasted that with the union leaders who she believed were trying to block economic progress. She believed that Victorian family values were the way to improve society, through people bettering themselves. This was not just through economic means, "but there was an element of it being linked to respectability and societal values", Prof Toye says. Conventional marriage and a nuclear family were the building blocks, he says. One example of her impact on society was the inclusion of Section 28 of the Local Government Act 1988. The controversial clause stated that a local authority shall not "promote the teaching in any maintained school of the acceptability of homosexuality as a pretended family relationship". Because it did not create a criminal offence, no prosecution was ever brought under this provision. While the legacy of many Thatcher policies remain to this day, Conservative Prime Minister David Cameron wants to legalise gay marriage - a stance inconceivable to Baroness Thatcher, and a "huge change", says Prof Toye.